White Ginger Barbecued Ribs - A recipe from Savor California, the online showcase for extraordinary gourmet foods and beverages from California. Combine ingredients. Mix well and pour over ribs. Cover and marinate in refrigerator overnight. Remove ribs from marinade and reserve marinade in saucepan. Place ribs in shallow pan and cook in the oven for 30 minutes. 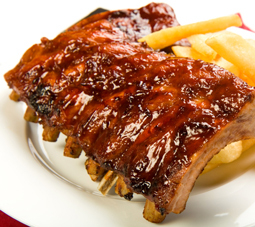 Move ribs to grill and barbecue slowly over low flame until done, brushing ribs with glaze every 15 minutes.